If you know anything about me and what I believe in, you know that I’m a huge advocate of quality professional development (PD). Professional development is the key to staying current, innovative, aligned, and being the best you can be in your profession. Unfortunately, not all PDs are created equal. Sometimes your school and/or district will provide professional development opportunities that check off the requirements but don’t leave you feeling fueled with new ideas, strategies, or inspiration. As nice as it would be to have your school invest in your growth in the ways you need it most, that is rare. If you’re one of those teachers that find yourself needing more or wanting to explore professional development outside of what your school provides but pause when you think about how to fund it, you’ve landed in the right place! It’s time to start taking your professional and personal growth into your own hands! Start by researching different professional development conference and training opportunities that align with what you feel like you need and want. Here are a few places to start. Most professional development opportunities cost money, which can be a barrier to getting access to what you need but it doesn’t have to be. Did you know there are ways to fund your own professional development that require little to no expenses out of your pocket. The first option is Donors Choose.I’m sure you’ve heard of Donors Choose but I’m also pretty sure many of you haven’t thought to use it for professional development. Most people think that Donors Choose is a site where teachers receive funding for just classroom projects and products that help boost the learning experience of children. It is often used for classroom items but it is also used for so much more! Professional development qualifies as a classroom “project” because your growth and learning ultimately impacts students! Unfortunately, since most teachers don’t view professional development as a project they don’t think to seek funding through Donors Choose for PD opportunities. Many teachers have done it and were sponsored to expand their learning. 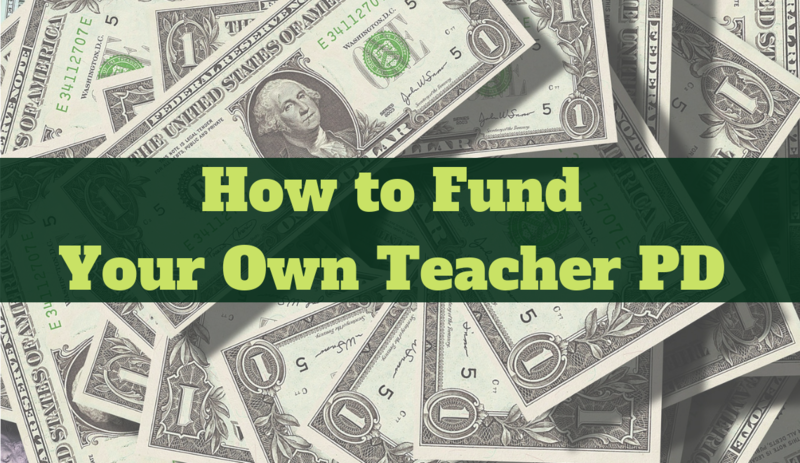 Check out this post to get tips on how other teachers just like you secured funding. Alongside of Donors Choose, there are also a few other options for funding your own professional development. Here’s a list that I’ve created for you. I would suggest that you spend some time to review the information provided in this post and see which option(s) interest you. Only you can decide what you need to help you grow in the areas you want to grow in. The good news is that there is funding out here for you, you’ve just got to identify where and go after it! I also think it’s worth reminding you that not all professional development happens at conferences or trainings. Some of my best professional development has come from getting certified, reading books, or even talking to people who were excelling in what I aspired to do or become. Hopefully this post makes you pause from all your busyness and reflect on what professional development you need and inspires you to get it funded through an option presented here. 😉 I hope this has been helpful and enlightening!